Here is last night’s Roundtable video. Mark (PittPT) and Matt (PittintheVille) joined me for a lively hour of Pitt football discussions. The QB situation between Kenny Pickett and Ben NiDucci… (Matt’s name for Ben DiNucci)… and how they were handled in the last game. Those are a few issues – take a listen by yourself and then post up some comments for us all to talk about. Wallace Wade Stadium (40,004/Natural Grass) • Durham, N.C.
LINK (PDF): Pitt Game Notes (vs. Duke) These are the best info dumps about Pitt football. Pitt-Virginia to kick off at 12:30 p.m. The Oct. 28 game at Heinz Field will be televised locally by AT&T SportsNet. Oct. 21: at Duke* (ACC Network/WTAE-TV in Pittsburgh), 12:20 p.m.
Oct. 28: Virginia* (AT&T SportsNet), 12:30 p.m.
Nov. 9 (Thurs. ): North Carolina* (ESPN), 7:30 p.m.
Anther great evening with the POV’ers – and some new blood joined in with TX Panther (Mike) and Altoona Josh (Josh) both long time readers and commenters… and now commentators. As you may have figured- there wasn’t a lot of deviation between us when discussing the season so far. However, there was some when it came to this weekend’s game. Everyone but one felt there was pretty much no way we’d lose this game; I’m the outlier there. Something feels very ‘off’ about this season – TX Mike agrees with this also – so nothing would surprise me in 2017 for our team. I don’t think we’ll lose. But I wouldn’t be surprised one bit if we did. Do not forget about the POV Tailgate on Saturday Morning – Red 5A lot and I’ll have more info up tomorrow, or later today. We have a ton of things to discuss and the most notable issue is obviously the YSU (debacle) game. Reading our previous comments on here I see a whole range of attitudes about our showing last Saturday and what we feel might happen this Saturday. Oh, BTW, who won the closest score for YSU? Right – me! 28-21 Pitt, although I did think it would be four TDs in regulation play. And I’ll tell you why. Because all those positions with “?” question marks beside them in our previous article on here pretty much turned out to be valid. But this is what to expect with this young and/or inexperienced lineup. Well, they are a week older and a week more experienced now aren’t they? But will that make a difference against the more talented PSU squad? We’ll do our formal predictions thread on Friday again so put your thinking caps on. The Oddssharks.com site has PSU at just around a 20 point favorite, however, I just heard on the radio some other bookmakers had PSU at (-) 23. Sorry to say that to this Pitt fan that sounds not all that far-fetched. Chris Peak of Rivals just posted up a great graphic showing a breakdown of the Pitt passing game against YSU. Some real interesting info – and some we already knew (best info source on Pitt football). It is that day of the week again folks – get your computers and phones fired up… I’ll be in the Roundtable meeting room at around 7:50 or so. if you log on and I’m not there don’t leave – I may just be out of the room for a minute. Predictions on the season and individual player’s production. …and I’ll update those with other ideas as they come to me – I’m busy until this evening. See you then and any new comers – please don’t hesitate to jump in we need to get some new blood going in these shows. 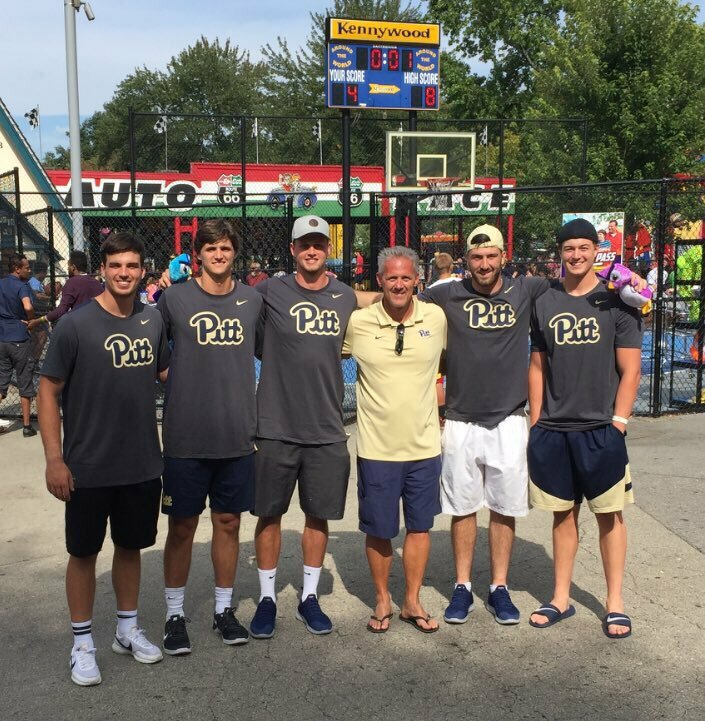 Here are the QBs at Kennywood – courtesy of a POV commenter. You can see that Pickett (far right) is no small kid coming out of HS – When I saw him in gym clothes at the Pitt Pro Workout Day back in March I was impressed with his overall size – arms and chest also. Bigger than all the other scholarship QBs that way (they were all watching the Seniors workout for the NFL scouts in on the Southside). Pickett is listed at 6’2″ and 215 in the roster – even though all the recruiting sites had him bigger at 6’3″ and around 225. He’s definitely a legit 6’3″ . I’d say now that he has been at Pitt over the last 8 months with an S&C coach he’s probably at about 230. Big strong armed kid.